If you have plenty of construction work during the winter, consider following these tips to keep your business flowing smoothly. During the colder months, there are multiple things that you will need to do in order to maintain your tools and equipment and we have a list of things that you will need to know if you don't want to spend a lot of time warming up your equipment and oil lines. Be sure that the oil used in your equipment matches the outside temperature. Engine oil viscosity should be verified to make sure you are using the right one. Instead of waiting extra time for the oil to flow after the equipment has been turned on, you must use a low viscosity engine/hydraulic oil so it can flow faster. Be sure to change your oil before and after the winter season. Regarding coolants, having the right mix is vital to keep your engine running and your equipment ready. Ideally, a 50/50 ratio of coolant and water will keep your engine running, however, in very cold climates you might want to use 70 to 30 coolant to water ratio to prevent water from freezing. Be careful that much coolant can make the water pump work harder and too much water might freeze creating additional stress and issues in your engine. Before the winter season begins, make sure to verify that the radiator is filled to the cap, and inspect the cap for proper pressure. What About the Battery of Your Heavy Equipment? Before winter season and even throughout the coldest months, verify that the electrolyte of the battery is filled up to the indicated level. It is a good idea to check the alternator and test the current of the battery. Your battery terminals need to be debris and rust free, otherwise, the battery will drain slowly and sooner than later you will have a dead battery. When the equipment is stored and there are no plans to use it for a certain amount of time, remove the batteries and store them inside a building or warehouse. If the battery is not being used for an extended period of time, then you will need to maintain the battery connected to prevent it from drain completely. Fuel and proper tire pressure are two important components that should be checked during and before the winter season. Tires should be checked for the proper tire pressure and look for wear marks on the tire. Low temperatures will reduce the tire pressure so if you have the option, consider to use track mounted equipment instead of tire-mounted equipment. Grease Points - Properly grease all areas to prevent moisture from building up. Remember to use low-temp lube as recommended by manufacturers. DEF - Newer equipment uses DEF, diesel exhaust fluid, but this one will freeze at 10 degrees or below. Make sure that there is a way to heat and thaw frozen DEF to keep your equipment running. 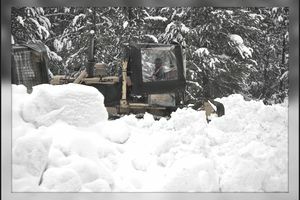 Undercarriage - Remove excess of snow or debris below as it will increase the operating costs of your equipment. Batteries - Avoid charging a frozen battery as it will normally explode.